Want to shoot hoops by London Bridge? Don’t worry we can rustle up a court with a pretty special backdrop. 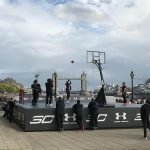 With Steph Curry in London, Synergy and Under Armour wanted an iconic background. Even the wind off the Thames and the astonished passersby didn’t put him off his shot.